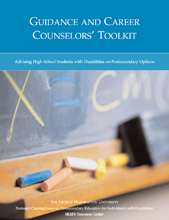 Advising High School Students with Disabilities on Postsecondary Options This 192 page resource contains answers to counselors' most frequently asked questions about postsecondary opportunities for students with disabilities. Students and their families are encouraged use the toolkit to help guide their transition planning for college and career. Click here to access the Toolkit online. It has been vetted by the U.S. Department of Education. Welcome to the HEATH Resource Center at the National Youth Transitions Center! Since 2000, the HEATH Resource Center has served as a national clearinghouse on postsecondary education for individuals with disabilities, managed by The George Washington University Graduate School of Education and Human Development. Now, The HSC Foundation has partnered with the George Washington University to expand the content of this resource and to designate it as the official resource website of The HSC Foundation’s National Youth Transitions Center. The HEATH Resource Center is a web-based clearinghouse that serves as an information exchange of educational resources, support services and opportunities. The HEATH Resource Center gathers, develops and disseminates information in the form of resource papers, fact sheets, website directories, newsletters, and resource materials. HEATH Resource Center is a collaborative effort among a network of professionals in the areas of disability, counseling, transition and postsecondary education. Thank you for using our website! Ivymount School and Programs provides school- and community-based services for children and young adults with special needs from throughout the Washington metropolitan area. The school program serves more than 200 students, ages 4-21, with speech and language impairments, learning disabilities, intellectual disabilities, health impairments, and autism spectrum disorders. The classrooms are structured to serve students to serve students with a range of academic and cognitive abilities, including, in some cases, those who have the potential to obtain a high school diploma.